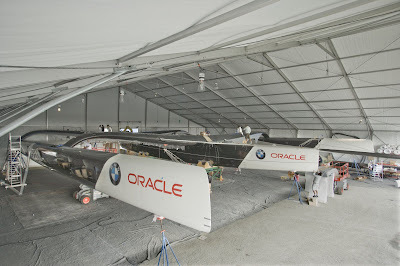 Anacortes, WA, USA, August 22, 2008- BMW ORACLE Racing said today it was very pleased to confirm that after nine months of intense activity its team in Anacortes is in the final stages of preparing its new 90-foot multihull yacht for sailing. "This is a very special boat and represents a special achievement by a hugely committed team who are among the world’s best at what they do," Coutts said. 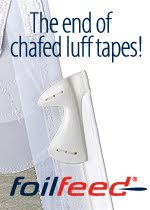 We have learned a lot in getting to this point and now we are looking forward to testing it on the water." The yacht is a key element of the team’s preparation for the next America’s Cup, representing San Francisco’s Golden Gate Yacht Club (GGYC), on which a ruling is expected from the New York State Court of Appeals in the next six months. The team partnered with Van Peteghem / Lauriot Prévost (VPLP) of France and one of the most successful skippers in multihull racing, Franck Cammas, to design the innovative trimaran. Led by Mark Turner and Tim Smyth, the BMW ORACLE Racing construction team has worked in a purpose-built composite yacht construction facility housed in a 100-foot x 200-foot, three-story shed. Janicki Industries in nearby Sedro-Woolley provided high-tech precision tooling. "Today, everyone is proud to have reached this milestone in the final launch preparations," Turner said. "Our team has worked hard and we have enjoyed great local support." Turner said the team is delighted by the expertise available in Anacortes, which has a well developed cluster of marine infrastructure, aerospace-quality tooling and other support operations required for such a high-tech undertaking. Bringing unique technological competence and setting new standards in the area of intelligent lightweight design, BMW has been a key partner in developing the boat. BMW aeronautical engineers, Christoph Erbelding and Thomas Hahn, have stayed with the design team since the 32nd campaign providing unique expertise in finite element analysis, which is a key tool for fulfilling EfficientDynamics requirements in the automotive industry. Erbelding works with the rig team in Valencia and Rhode Island, while Hahn is based with the hull structures team at Anacortes; both are integral team members in ensuring the boat is as stiff and light as possible while delivering maximum performance.